Executive gentlemen know that it takes a strong, self-assured woman to hold their attention. 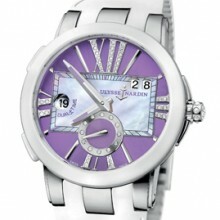 The Executive Lady is for the woman who takes charge of her life, orchestrating it with the skill of a master composer. 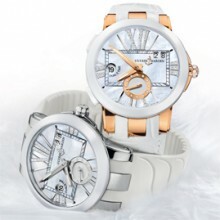 This special, individually numbered timepiece celebrates every woman who is making her mark in the world – her way – and garnering the interest of the man in her life who wants to show his adoration for her. 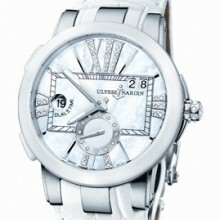 Like the woman whose wrist it adorns, the Executive Lady is not to be underestimated. Although purely feminine in aesthetic, the self-winding timepiece holds the same exactness and durability of its male counterpart – the Ulysse Nardin Executive Dual Time. In 1996, Ulysse Nardin introduced a patented Dual Time system – one of its many technological breakthroughs. This revolutionary system exists in the Lady Executive. With only one press of the ceramic pushers along the bezel, the hour hand instantly adjusts to a different time zone without ever having to leave her wrist. Whether traveling from one continent to another or simply wanting to stay “in time” with those she loves, the Dual Time system is a useful and convenient feature to have on hand at home or far away. Enhancing the Executive Lady’s appeal is its durable-meets-delicate composition, making it an ideal timepiece for everyday use while always presenting an elegant, finished appearance. Ceramic, one of the strongest, longest-lasting materials, forms the snow-white bezel, as well as the clasp on those timepieces possessing a rubber-band execution. A sapphire-crystal cover guards its glistening diamond and mother-of-pearl or purple galvanic dial, and a 40-millimeter, stainless-steel or 18-karat gold case keeps all of its precious and precise elements securely in place. No-nonsense in demeanor, practical in complication and with a refined, all-eyes-on-her styling, the Executive Lady is as confident and stunning as its muse – the woman who knows she has it all – and the perfect selection by the man who wants to give her his all. Functions : patented quickset 2nd time display at 9 o’clock. Permanent home time at 9 o’clock. Patented Big Date display. Oversized small seconds-hand counter. Bracelet : white alligator leather or white rubber strap with folding buckle.